Alpe d'Huez wrote: Congratulations to Rob Gronkowski on retiring at the right time. Plus, saving what appears to be his entire salary, living only off endorsements, and a fairly frugal lifestyle. His agent, Drew Rosenhaus, said don't be too shocked if he changes his mind, a la Jason Whitten. Or just comes back to fill in a roll later this season if the Pats need him. I don't know, he seemed pretty resolute to me. The AAF rules may be having a small impact on the NFL. The rules committee just voted nearly unanimous, to have an alternative to the onsides kick. That is, if you don't want to try it, you can try a 4th and 15 from your own 35 yard line. Giants owner John Mara was the only one to vote against it, thinking it was like the Arena Football League. But the numbers show more players are hurt on kickoffs than any other play, so this is one step to eliminating the kickoff entirely. I wondered that too at first, thinking it was the strangest thing. I mean, who throws a football well with their weak arm? How often do they? And how can some do so the same speed with both arms, when they only work on mechanics with the dominant arm? I knew that couldn't be right, so I looked into it. Both throws are with the dominant arm, it's the step and direction they are throwing the ball that they measure. The throws are to the left, and to the right. Ohhhhhhh! Well, Sheet! Or Duh. Anyway, thanks for that bit of enlightenment. As for that AAF rule allowing a team the 4th & 15 try instead of the onside kick, it sounds a little bit like make-it take-it in gym rat hoops. 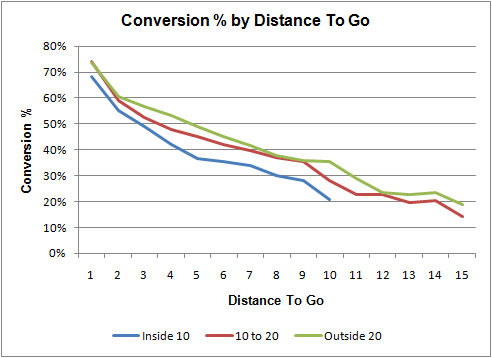 It seems like the percentage of successful conversions vs attempts would be greater via the 4th & 15 method than would the traditional onside kick. One study (actually discussed in this thread quite some time ago, probably over a year/2 years ago?) showed the % success of a 4th & 15 to be about 19%. 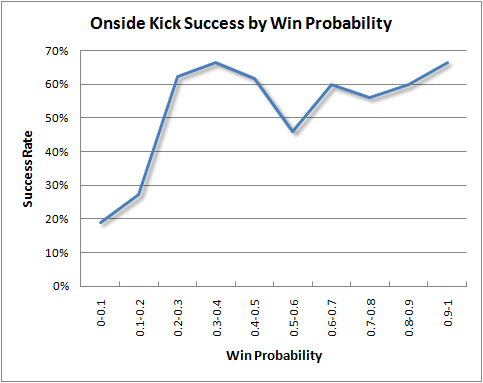 If that rate of success SEEMS greater than the % of successful onside kick recoveries, keep reading. For example, a 4th down and 3 at the 50 yd line could be converted 56% of the time. Further, from that article, such a successful conversion (after starting with a 4th & 15 from the 35 yd line) would put the ball on at least the 50 yard line, which would result in 1.8 "expected points" (based on data from 2,400 NFL games from the 2000-2008 seasons). 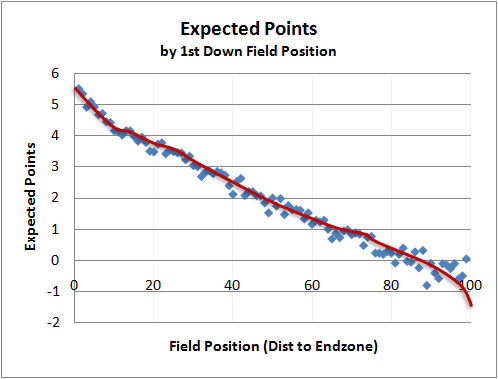 But expected points increases the closer to the endzone a team gets. So, lets say the 4th & 15 conversion nets a 30-yard gain, putting the ball on the defenses 35 yard line. The expected points from that ball spot would be close to 3 points. One could go through lots of mental gyrations over this. So, maybe the 4th & 15 to go spotted at the 35 option is a really good alternative to the onside kick. And then as to normal kickoffs, what it seems teams have done with the ball spotted at the 35 yardline is to kick the ball higher for the obvious reason, to give an offense poorer starting field position. And we know from stats that poorer the field position has lower success rates for scoring. Plus, it seems the number of runback attempts with the ball spotted at the 35 is just about equal to what it was when the ball was spotted at the 30. So, the NFL may actually have to eliminate kickoffs altogether. But I did not research the facts on this. Yup, good on Gronk. Hope he can find peace and passion for something else outside of playing the game. Alpe d'Huez wrote: Disappointed the Raiders signed Burfict. His career is also on the wanes, more than Matthews maybe, and he's a head case. Wasn't too wild about it either, but it's a cheap, 1-year deal, and he knows Guenther's defense inside and out. And he's a significant upgrade to the Raiders horrible LB corps. I do still worry about him in the locker room. I like the onside kick, it can add some excitement especially when a team has made a comeback. I guess that most of the kick return injuries are when small players meet immovable objects ! Like the hips, knees, helmets etc of much larger players. From an injury point of view it makes sense but I think the kicking in all facets of the game hase some value and some players are kick specialists either returning or kicking. Good kick returners are fun to watch. Well the new rules for kicks last year made the on-side kick almost impossible for the kicking team to recover. I like that in there, the "surrender index". I can't say I'm surprised, other than it was so sudden. Still, when they couldn't make payroll, and had one single person (Tom Dundon) basically bail the league out, the writing was really on the wall in hindsight. One person in near total control at that point. And when it appears the NFLPA wasn't interested in partnering with him, over what seems almost trivial - allowing practice squad players to play in the AAF - he pulled the plug. It seems in his eyes, this was the one single pipeline for having the AAF operate as a feeder league to the NFL, and that was key to their success. What makes this more troubling is that Charlie Ebersol said the AAF had a financial system in place to allow the league to last several seasons, though he didn't point out what that was, or why. It lead me (and likely others) to think he had enough diverse backers who were willing to take a large loss leader, and plan for long-term, patiently. But apparently that was not the case, and never the case, hence the need to get Dundon's help. Right now it appears the league is in suspension, not dead. But I'll be surprised if they come back. They in theory could broker some sort of deal, play another week, and have a championship and call it done. Or someone else could show up with some cash, I just don't see it. San Diego news channels reporting that small AAF staff to remain for possible restructuring...? Blew in and out like the wind..we have too many half sports..major league soccer can't get stadium support..Clippers out,Chargers out..lacrosse..shaky.hockey is back after leaving.not sure this is a sports town..
Padres just spent some money but...the downtown shopping mall area that the stadium was built near is failed.. I did not think the AAF would have failed so soon, but reviewing the February 19 article below I guess I am not surprised either. I think what surprises me a little more is the NFL did not pitch in to help the AAF out financially, as the AAF could have become a legit developmental league. Maybe the owners were afraid the AAF might become a legit competitor to the NFL like the old USFL (remember Hershel Walker right out of college spurned the NFL and instead opted for the USFL's New Jersey Generals). on3m@n@rmy wrote: I did not think the AAF would have failed so soon, but reviewing the February 19 article below I guess I am not surprised either. I think what surprises me a little more is the NFL did not pitch in to help the AAF out financially, as the AAF could have become a legit developmental league. Maybe the owners were afraid the AAF might become a legit competitor to the NFL like the old USFL (remember Hershel Walker right out of college spurned the NFL and instead opted for the USFL's New Jersey Generals). Maybe the NFL is OK with their NCAA development league because they don't have to deal with it? that is probly very true. & don't have to fund it, which really is not having to deal with it. How short-sighted the NFL can be. I mean, I've felt for some time that there is someone at home sitting on the couch who could be playing in the NFL. All that some, even if a small portion, of those guys need after their college playing days are over is to strengthen their weaknesses, hone their skills, and get an opportunity. The AAF could have done that. ...is the first professional football league ever created to provide developing football players with a choice to play professionally directly from high school – a league where emerging players can hone their craft, play football, and be compensated for it. on3m@n@rmy wrote: At least so far there is still the startup Pac-Pro Football league (PPFL) (http://www.pacificprofootball.com/league/principles/). Add them to the list, along with the XFL, and Freedom Football League. I'll say what I did before, whomever starts a league is going to have to have a large supply of cash from a variety of sources, and those sources are going to need patience, and have to accept a very likely loss leader of more than one full season. If I were to start any league, I'd ask every single investor, "Can you handle us standing here in a year, knowing you're $10-20m in the red, and tell me you're still in it for the long run?" I do agree though that almost any league that survives, would be very beneficial to have some sort of support from the NFL, whether that's financial backing, or some sort of integration of players. jmdirt wrote: Maybe the NFL is OK with their NCAA development league because they don't have to deal with it? Of course, the NCAA has it's own share of problems. Plenty of them that people don't want to talk about. But it's already the feeder league into the NFL. One could also say that post-college, there are players in the CFL and Arena Football League that operate as a feeder to the NFL. They just have different rules. Quite different than the AAF even. It sounds like the NFL will not be involved at this point in running the PPFL, but some NFL coaches and GMs are having some input on what they'd like the PPFL's purpose and focus to be. I used to listen to Mike & Mike on the commute when I could, but got away from it the past couple years (vanpooling). I get most of my info from Twitter by following our local talk radio (710ESPN Seattle), and a couple other media guys (John Clayton, Ian Rapoport, & a couple teams). For instance, it was a 710ESPN tweet about Clayton's interview with Don Lee to discuss the Pac Pro Football league that led me to that podcast I posted earlier. You mentioned DA. I thought who the H is DA? So up to now I never listened to Damon Amendolara. I have to agree with you, it was awful. But I happened to pick a topic he discussed that hit close to home for me, that he and I are polar opposites on. Listening to his take you can figure out where I stand as the polar opposite. ■ As a group, the former players had much more abnormal tau than the control group. ■ No one in the control group had levels of tau as high as those found among some of the players. ■ Those who played the most years of football had the highest levels of tau. The scans provided an overall finding for the group but were less revealing when it came to individuals, limiting their utility as a diagnostic tool. Some of the former players had the same levels of tau as some people in the control group, for example. And there was no correlation between the amount of tau and the severity of symptoms. - The longer a player plays football, the more Tau that player's brain will develop. - A player cannot trust in symptoms as an indicator he (his brain) is in trouble. In other words, a player can have CTE without having symptoms. Those bits of information should be concerning to players, all football institutions in general (youth thru pro), and the public. This is also why I'm intolerant of comments by doofs like Amendolara who love seeing seeing a player's head "like it's not connected to his body anymore" (that's an exact quote), and that hits to the head (like the one posted above from the AAF that went viral) should be allowed in the NFL. BECAUSE that kind of hit is allowed in the AAF, the AAF deserved to die. https://www.bostonglobe.com/metro/2019/04/10/boston-university-study-suggests-pathway-diagnosing-cte-living/d8CnSj32291dQCtLuRH6jJ/story.html?event=event25 ...and then hit "Continued Reading". Even though I have always has sympathy/empathy for players with turf toe, I am reminded of the agony this week because my MPJ is **** angry as ****! I can't imagine being a 325 pound guy exploding off of that toe or a speedster cutting off of that toe! SEA and Wilson agree to 4 year $140 MIL (65 up front!) according to sources! I was actually thinking that they SEA had decided to move on, but holy *****!